I learned something new today: nectarines are a type of peach. Crazy, right? The difference between the two is that peaches carry a gene that gives it fuzzy skin. But nectarines will sometimes grow on peach trees on an outgrowth called a bud sport. I just totally blew your mind, right? I’ll let you sit with that for a minute. I know you have a lot to process right now. Paradigms have shifted and such. When it comes to summer fruit, I always neglect the nectarine. I’m all about peaches and watermelon and cherries, and I forget that nectarines are delicious and in season too. 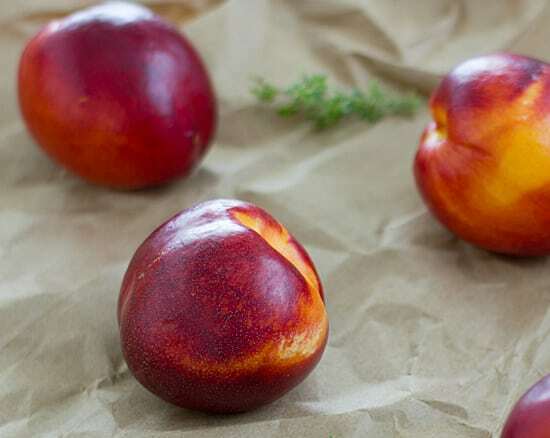 And apparently I’m not the only one–when I went to the grocery store to get nectarines for this recipe, I had a lot of trouble finding them until I realized that instead of having their own area, they were shoved into the corner of the peach bin. Poor nectarines! Although a fruit galette makes a nice, simple summertime dessert, I’m of the opinion that they make a good lunch or dinner too. And that’s exactly how we ate this Honey and Nectarine Galette–as a light dinner with a simple salad dressed with a citrus vinaigrette. The honey adds sweetness without making the galette too sweet. And without all that added sugar, the flavor of the fruit really shines through. Oh, and yes, I used prepared pie crust dough. I have a brand that I’m happy with that uses real ingredients and it saves me quite a bit of time. You are certainly welcome to use any kind of pie crust you like and you are also welcome to feel superior to me, shake your head at me disapprovingly, or condescend to me in any other way. Because I love prepared pie crust and you will never change that fact. Never! 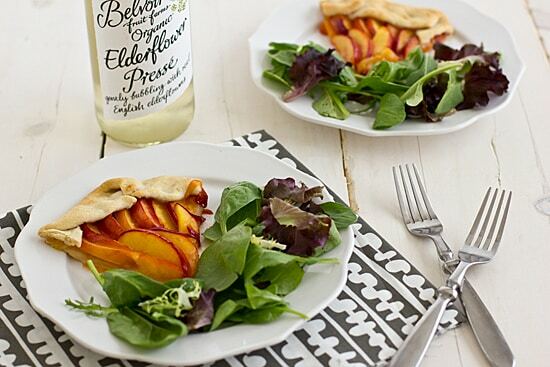 A summery galette that can be served for dessert or with a salad as a light main course. And all you need are 3 ingredients–yes, really! Preheat oven to temperature indicated on pie crust package. Lay crust on a rimmed baking sheet lined with parchment paper or a non-stick liner. 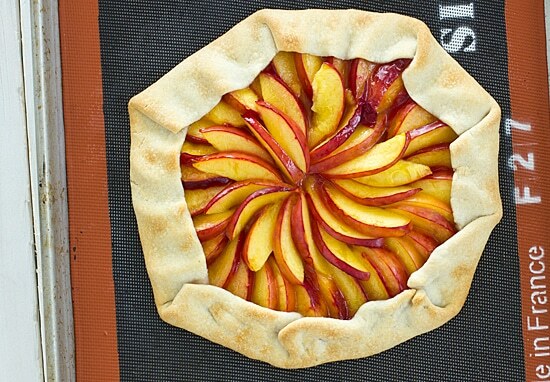 Starting about an inch and a half from the edge of crust, place nectarine slices in overlapping circles until you reach the center of the galette. Fold edges over filling. Drizzle with honey and bake for 10-15 minutes or until crust is golden. YUM! This would be a beautiful dessert for a dinner party! Good job! Wow, this looks incredible. Love nectarines!